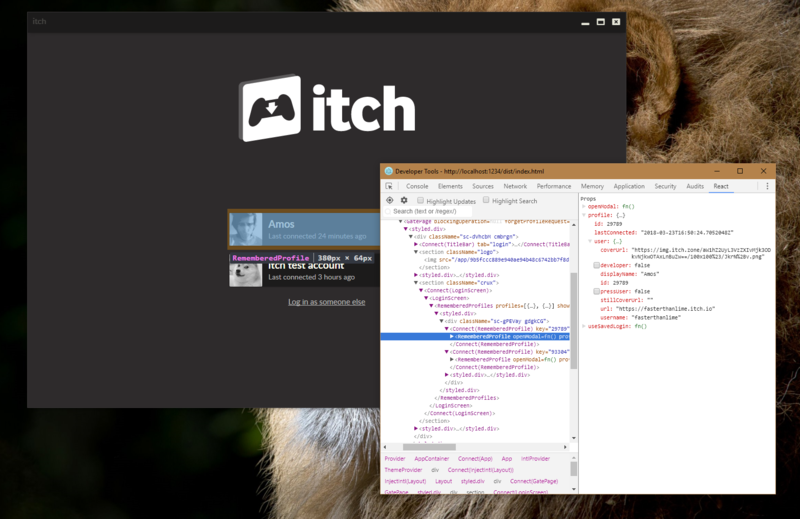 itch is built in TypeScript and runs inside of Electron. Use the nodesource binary distributions to get an up-to-date one. Then, clone the https://github.com/itchio/itch repository somewhere. For native modules, you&apos;ll need a compiler toolchain: Visual Studio 2015 on Windows, gcc/clang on Linux/macOS. See the node-gyp page for more information on this. The first run will seem slow, because the compile cache is empty. Subsequent runs will be much faster. There are three environments in which the app can run: development, test, and production. production is what the app runs on when it&apos;s released as a package to end-users. It&apos;s a fast, no-nonsense environment, and it enables things like self-updates, locale updates, etc. test looks a lot like production except that some things are disabled: logging, for instance, is suppressed. The app will also not exit by itself, but print a well-known string to the console, allowing the integration test runner to kill the app itself. The main process is the first process when itch is started. It&apos;s basically a node.js runtime. Maintain the canonical version of the app state. Each native window conceptually has its own renderer process, which is basically a Chromium process (but with node.js integration). All processes have a redux store, the main store is the reference, and the other stores are synchronized by sending inter-process messages, which is done transparently by redux-electron-store. The React devtools are automatically installed in the development environment, although you&apos;ll need to reload the page after opening the devtools to see the tab. you can export DEVTOOLS=1 before starting the app so that they open as early as possible. See Environment variables for a list of useful ones. In development, the app serves a debugging interface on port 9222. If you open a chrome://inspect tab in Google Chrome, it should show up under Remote Target (#LOCALHOST). (If it doesn&apos;t, you can add it manually). You can use those to step through code in the main process. This is particularly useful if an exception is thrown, but you don&apos;t know exactly why. Note that pausing in the developer tools will freeze the whole app, so your OS might complain it&apos;s unresponsive. TypeScript sources and static assets live in src. They&apos;re compiled and bundled by webpack. In development, files are recompiled automatically and the chrome side is served over HTTP. In production, they&apos;re precompiled and packaged so that a lot of development dependencies are not included in the final builds. When the app is started in developent, it watches for file changes, and reloads parts of itself automatically. This mostly applies to the renderer side of the app, React components in particular. By having your code editor and the app open side to side, you can quickly iterate on the looks of a React component. We use prettier to make sure the codebase has a consistent style. Some text editors have plug-ins for prettier, which can help you format on save. There are workspace settings for the Visual Studio Code prettier plug-in in the repository. In development, async/await code is transformed using babel to bluebird promises, which in turn uses coroutines and has long stack traces support. This lets us dive into issues that involve several promises awaiting each other. In production, they&apos;re left as-is, since both Node and Chrome now support async/await. React components are TypeScript classes that extend React.PureComponent. All components are pure components, never extend React.Component instead. We have a hook function that allows writing fully type-checked connected components (it uses redux&apos;s connect under the hood). Look at src/renderer/basics/ for simple examples. Most of the CSS styles in the app are handled by styled-components. This lets us handle theme switching, namespace and compose our styles easily. Some text editor plug-ins, like styled-components for Visual Studio Code provide syntax highlighting for css blocks. Check out the pages linked above to learn more about what their purpose is, when and how they&apos;re run, and how they&apos;re written.